President Donald Trump violates the First Amendment by exacting retribution on critics in the media, the writers organization PEN America alleges in a new lawsuit. The complaint specifically alleges that Trump has struck back against Amazon, CNN, NBC and individual journalists, due to their coverage of him. “Trump has repeatedly called for action to punish the online retailer Amazon because Jeff Bezos, its chief shareholder and CEO, owns the Washington Post, whose accurate coverage of his Administration the President finds objectionable,” PEN America alleges. The organization adds that earlier this year, Trump directed the Postal Service to review shipping rates charged to Amazon and other companies. Last week, Postal Service proposed a 12% rate increase for the shipping service used by Amazon. PEN America also characterizes the Department of Justice's lawsuit to block AT&T's merger with Time Warner as an instance of retaliation over CNN's critical coverage. A federal judge dismissed the government's lawsuit in June, allowing the merger to proceed. The Department of Justice is appealing that ruling to the D.C. Circuit Court of Appeals. PEN America also notes that Trump threatened NBC last year, following a news report about statements Trump made regarding nuclear weapons. 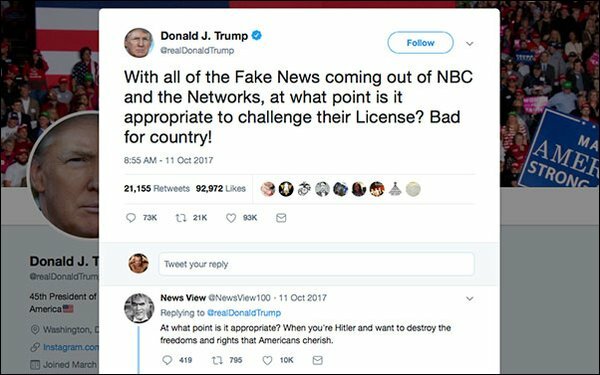 “With all of the Fake News coming out of NBC and the Networks, at what point is it appropriate to challenge their License? Bad for country!” he tweeted. NBC affiliates hold broadcast licenses subject to Federal Communications Commission regulation. “Revocation of a federal license is a death sentence for a broadcast station,” the complaint says. The complaint also alleges that the administration has targeted individual journalists like CNN reporter Kaitlan Collins, who was banned from a press conference this summer because she "had earlier asked the President questions that the White House deemed 'inappropriate'." PEN America is seeking a declaratory judgment that Trump has acted unconstitutionally, and an injunction prohibiting the federal government from retaliating against media organizations and journalists for their criticism of the White House.